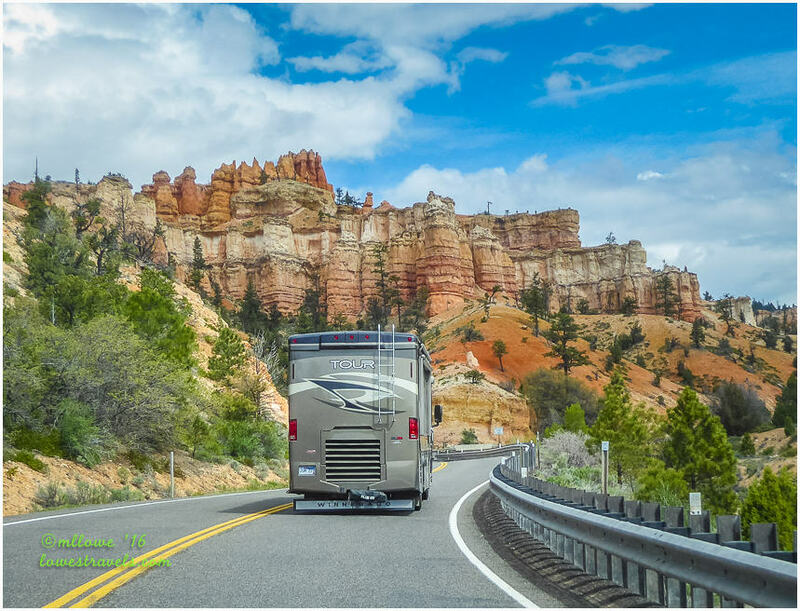 Moving to Ruby’s Inn RV Park from Cannonville was probably the shortest campground move we’ve ever made, a mere 13 miles to get us right outside Bryce Canyon National Park for a week. A little heads-up here: this post is loaded with vibrant images of rocks galore! No need to hook up the car for this short jaunt! 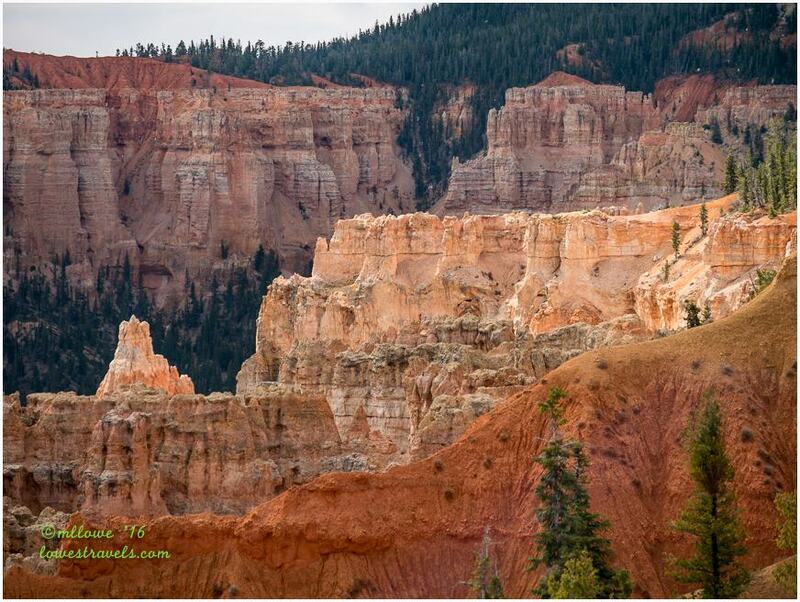 Prior to the move we had already filled our eyes and minds with the awe and wonder of this awesome place as we took the scenic drive with friends Dave and Faye. We did the drive the right way by going all the way to the end of the road and working our way back – leaving the magnificent view at Inspiration Point as one of the final stops. It was mind-blowing, and a perfect standing ovation for this place. 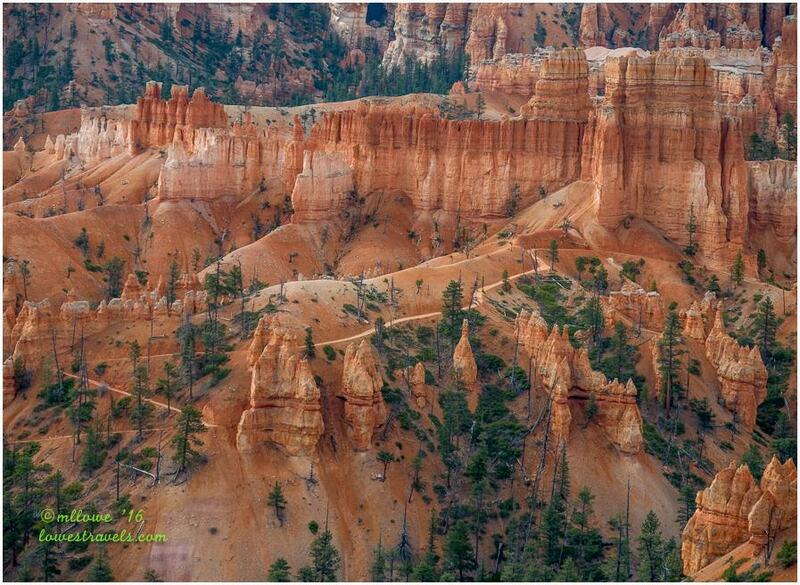 Bryce Canyon is not a canyon, but a 56.2 square-mile series of more than a dozen natural amphitheaters. It’s a place like no other we’ve seen. 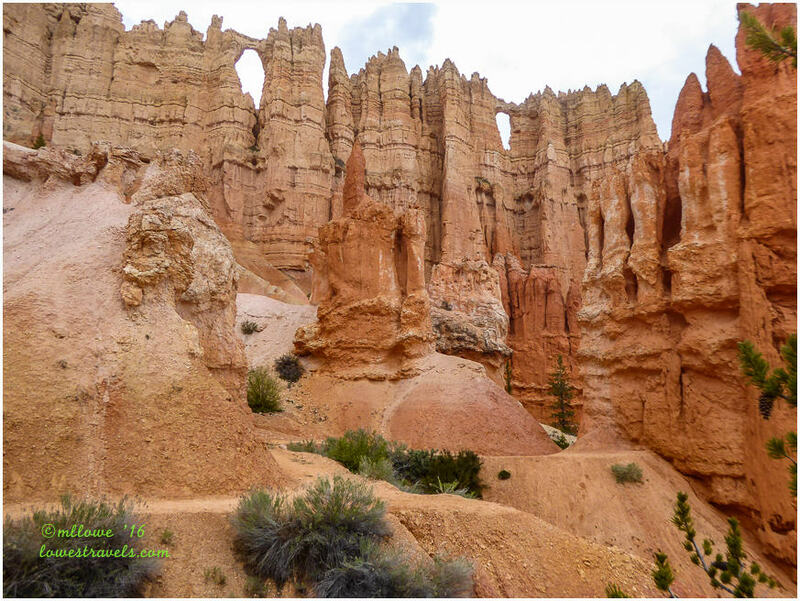 Its spires, rocky temples, castles, pillars, walls, windows and arches are arranged within huge amphitheaters of red rock that cannot be captured, although we certainly tried by keeping both of our cameras blazing every day. 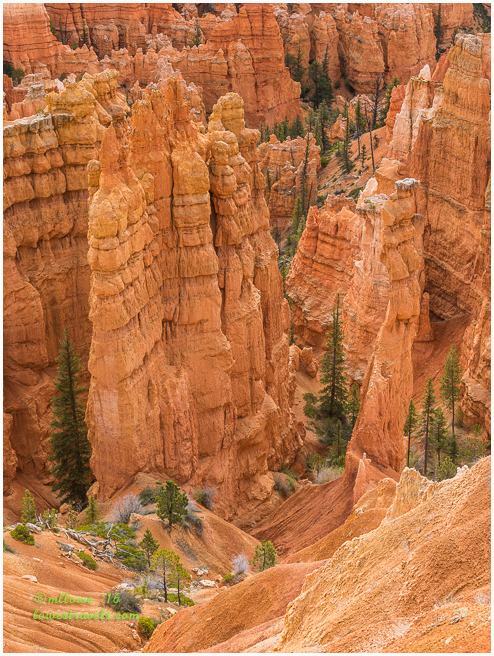 The vistas of spires displayed various shades of orange, red, ochre and pink with chalk-white highlights, depending on the lighting conditions and time of the day. They were so colorful and wondrous that we were constantly gasping right along with all the other tourists! 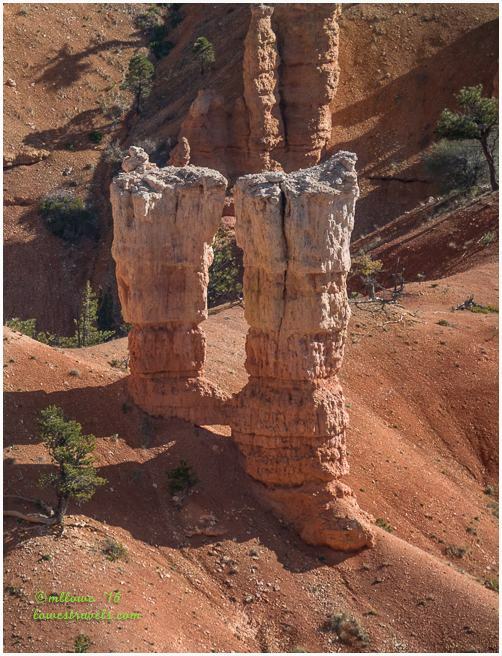 These nature-chiseled pinnacles known as hoodoos are yet another product of erosion. It all began about 55 millions years ago as the lower pink layer of iron and manganese was deposited as muds and silts in meandering streams and shallow lakes. The upper white layer represents limestone deposited later in a shallow lake system. Over time the layered sediments consolidated into rock, and the effects of wind, water and millions of frost/thaw cycles took over to carve the unique sculptures. 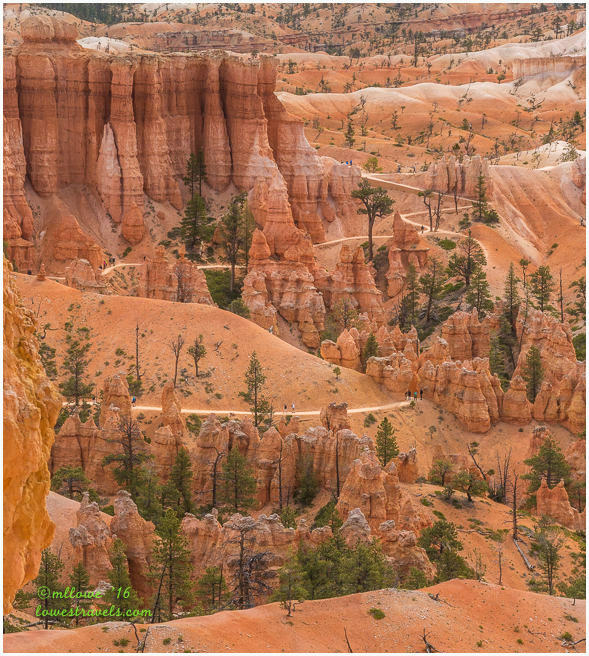 If interested, click here to read more information available from the National Parks System. 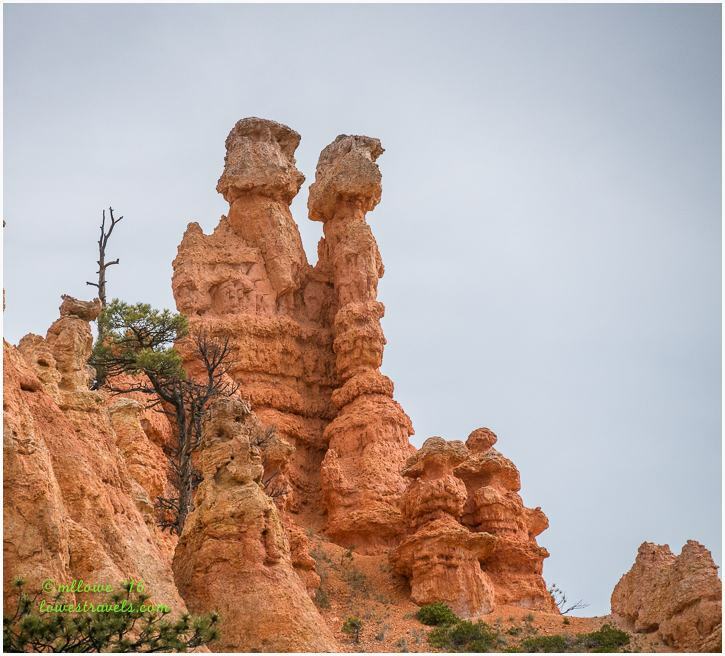 Many of the hoodoos, fins and spires have been given names, and for fun we added a few of our own. Besides, depending on the time of day and viewing angle they can look like something totally different! A pair of cowboy boots? 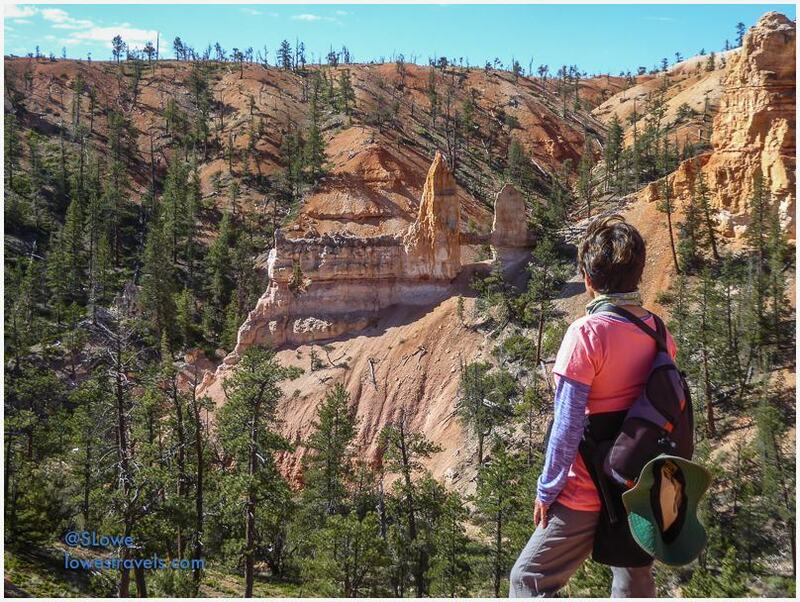 We hiked just about every available trail during our stay, several offering us a close-up view with a different perspective from the canyon floors. 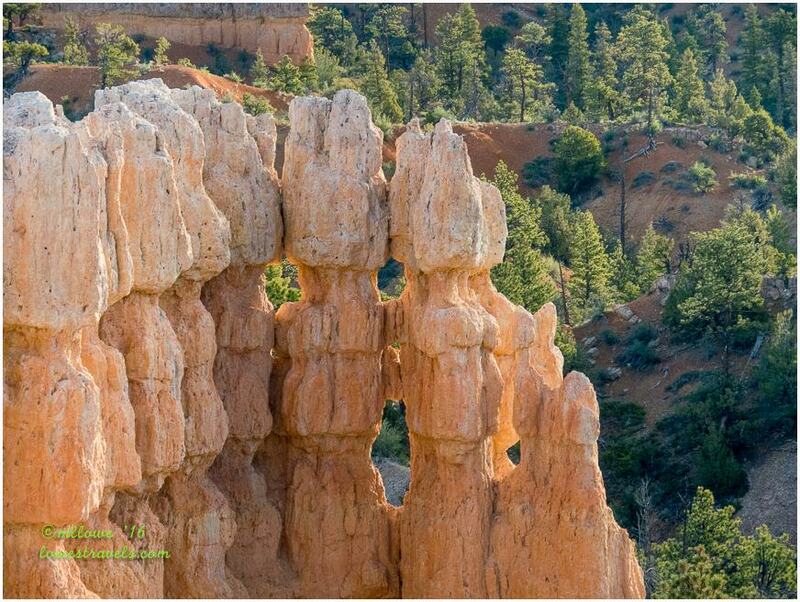 The sun and clouds created magical effects on the amazing rock sculptures. 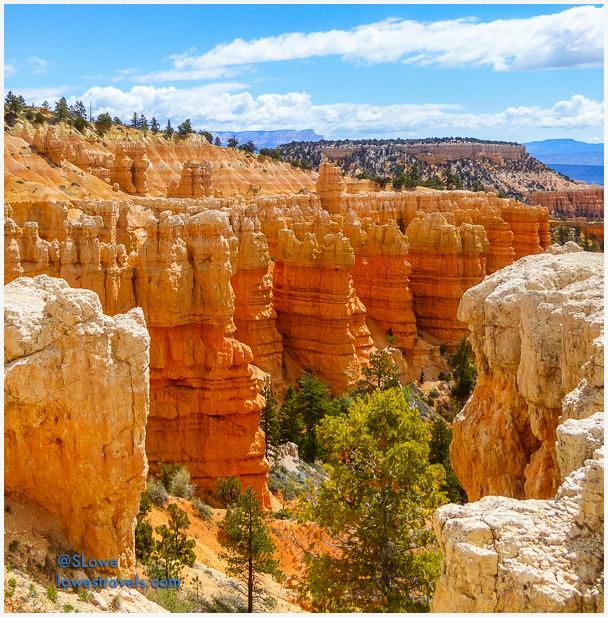 To see all of the hidden treasures we hiked trails rated from easy (Rim Trail and Bristlecone Loop) to medium (Sheep Canyon Trail) to strenuous (Fairyland Loop and the Figure-8 combination of Queens Garden, Peekaboo Loop and Navajo Loop). With both of us taking hundreds of photos every day, selecting the best ones to share was a challenging and time-consuming process. Folks who have been here will probably agree that it’s hard to take a bad photo! 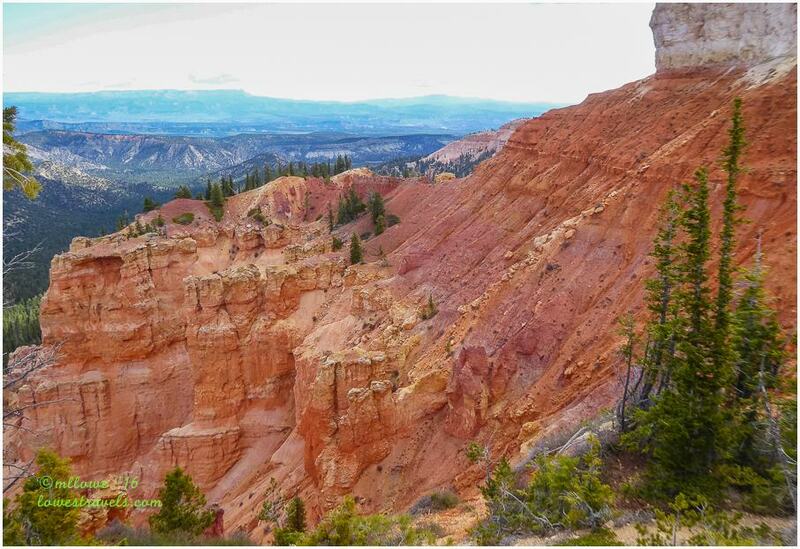 Most of the “must-do” trails we chose began from the rim with a steep descent into the canyons. Of course, that means a steep climb back up at the end of the hike. We definitely got some good workouts! 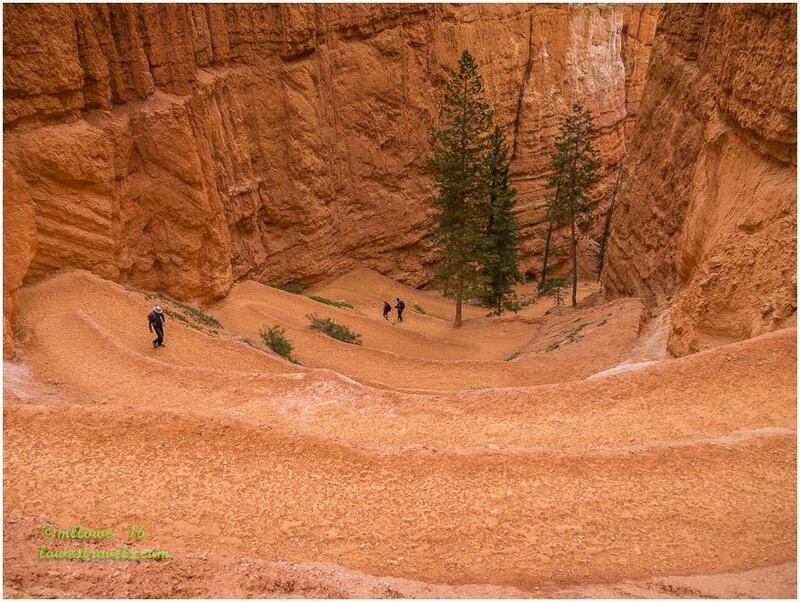 From afar we could see loads of tourists following Sunset Trail up to a junction with Navajo Loop. 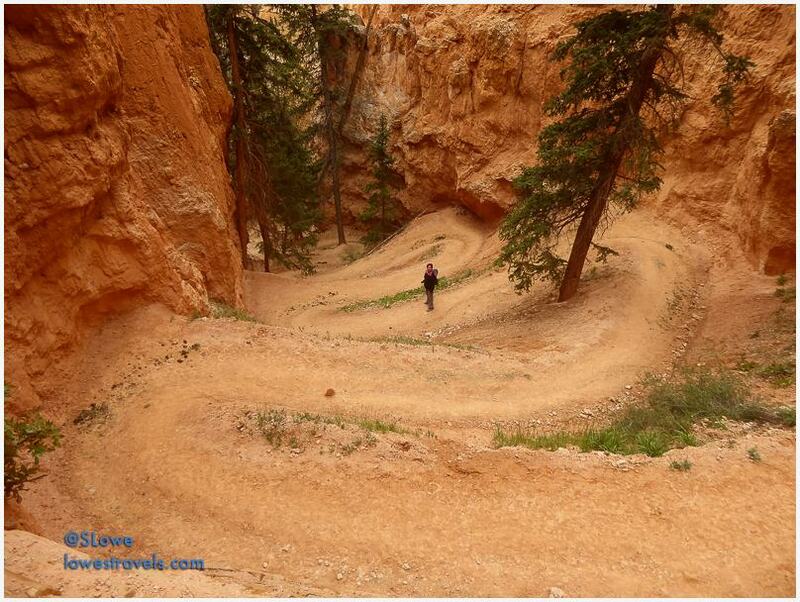 Many turned around when they saw the steep downward switchback, realizing the effort required to climb back out. 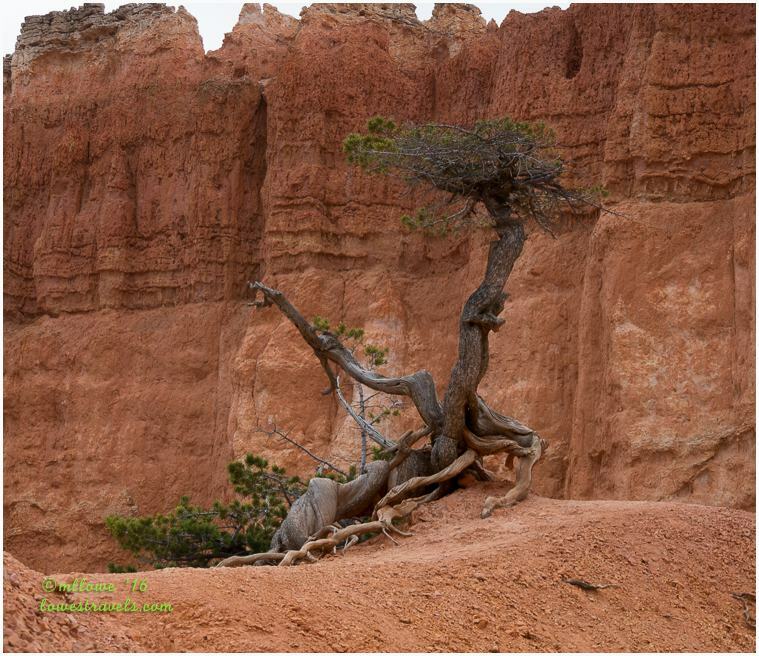 Trees clinging to the rim show the extent of erosion here. 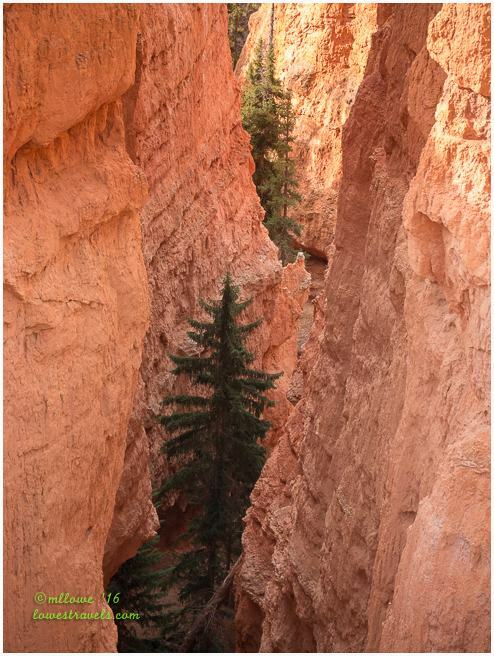 As roots become exposed scientists are able to calculate that the cliff is retreating at an average rate of about one foot every sixty years. 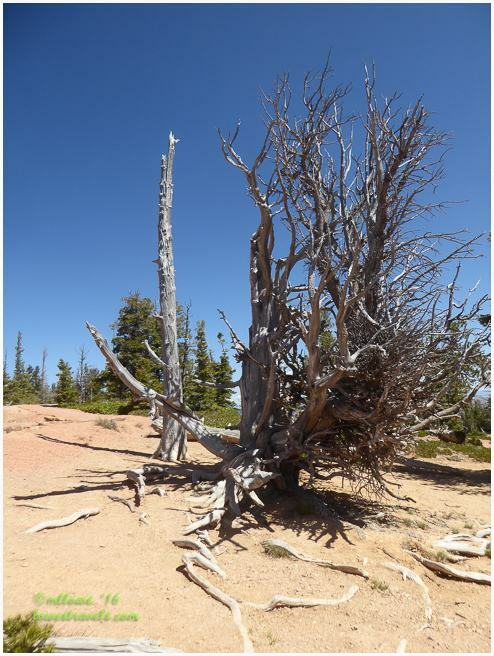 A Bristlecone Pine that lasted for 1,600 years. 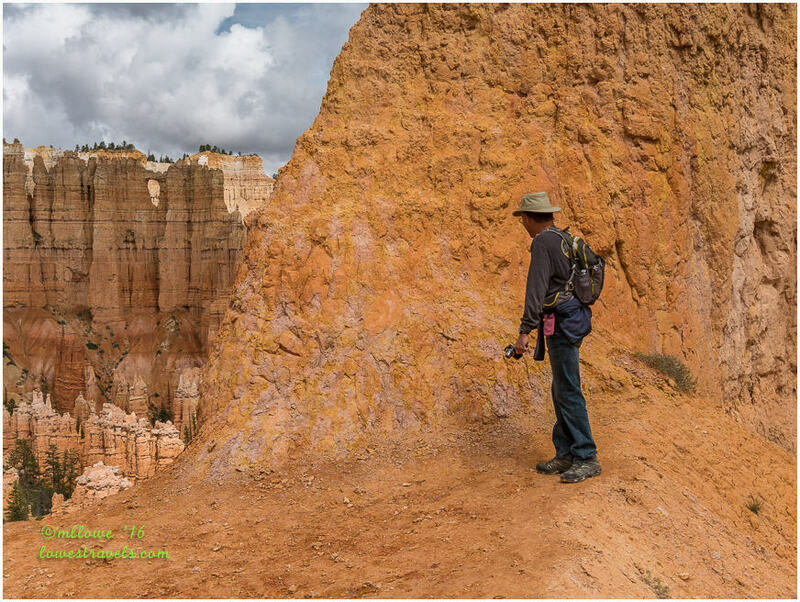 A hike we had planned along the Rim Trail was stymied by construction between Inspiration Point and Bryce Point, but we were able to add several miles from other outlying trails to make up for it. 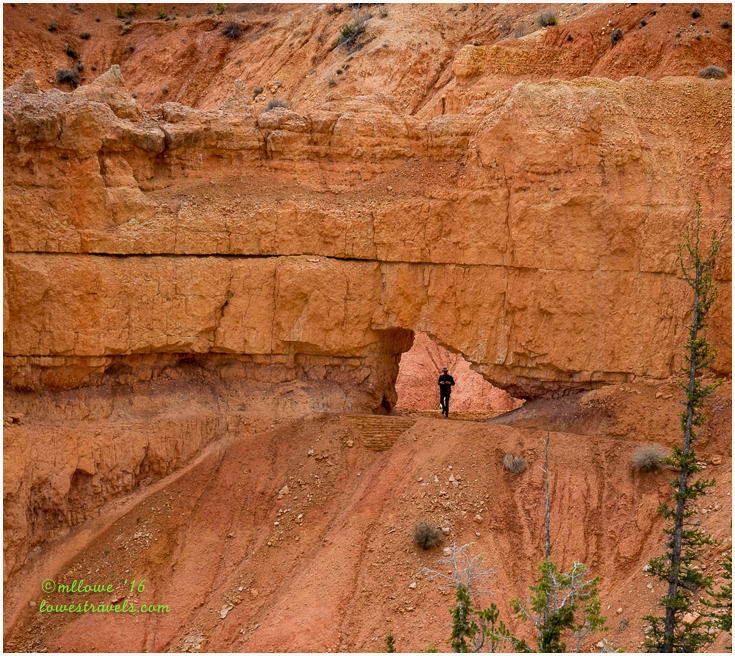 Peekaboo Trail – wow, did we love that hike! 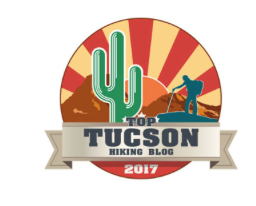 Beyond our hiking escapades, we had the pleasure of meeting fellow bloggers that Steve had been following for several months – Mike, Kathie and Opie from Life Rebooted. Opie is the cool and high-energy doggie of the group, and Steve forgot to ask if Opie was short for Opium? Maybe we’ll learn one day. 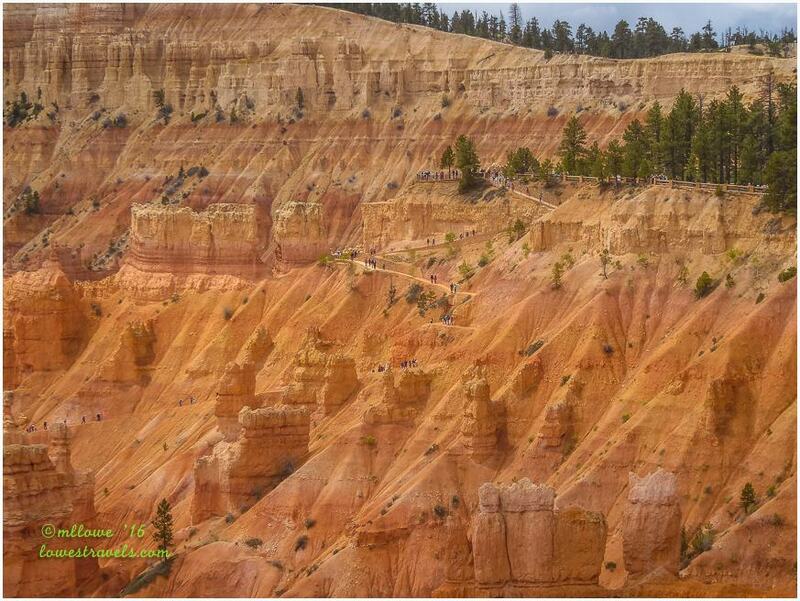 The natural beauty of Bryce Canyon left us in awe. 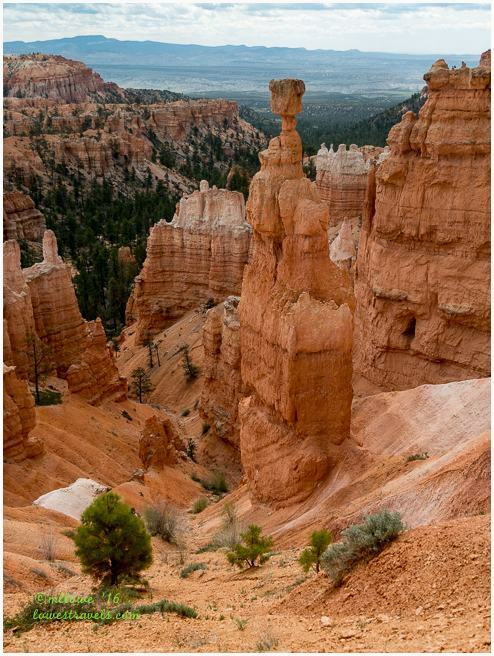 Stunning, breathtaking, spectacular and unique, this became our #1 must-do national park if we had to pick one. There is nothing like this anywhere else! 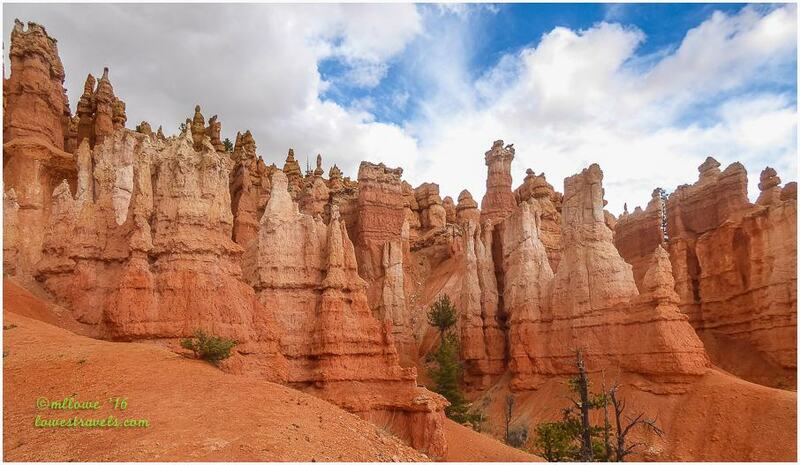 It may seem we lingered long – 10 weeks to be exact – in Southern Utah (also known as Red Rock Country). Our response is, “No way”! There are still many “stones” left unturned, and we’ll be back next year. Next up: We are out of Red Rock Country! Some of those views look awfully familiar! You take some gorgeous pictures. I like the picture of the two of you at the sign, do you do that for all the NPs? 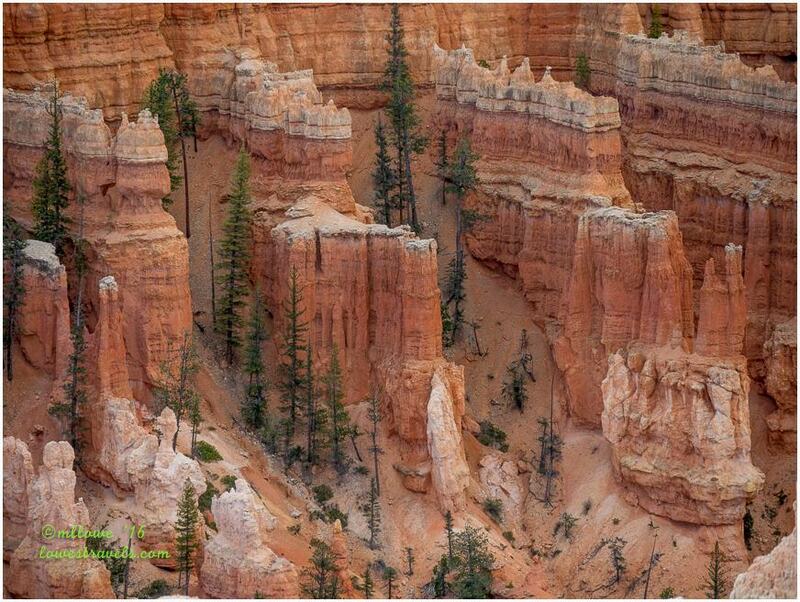 You two sound like major hikers, that you were able to do all the hikes in Bryce! It was so much fun to meet in person and I’m really hoping we can meet up again! 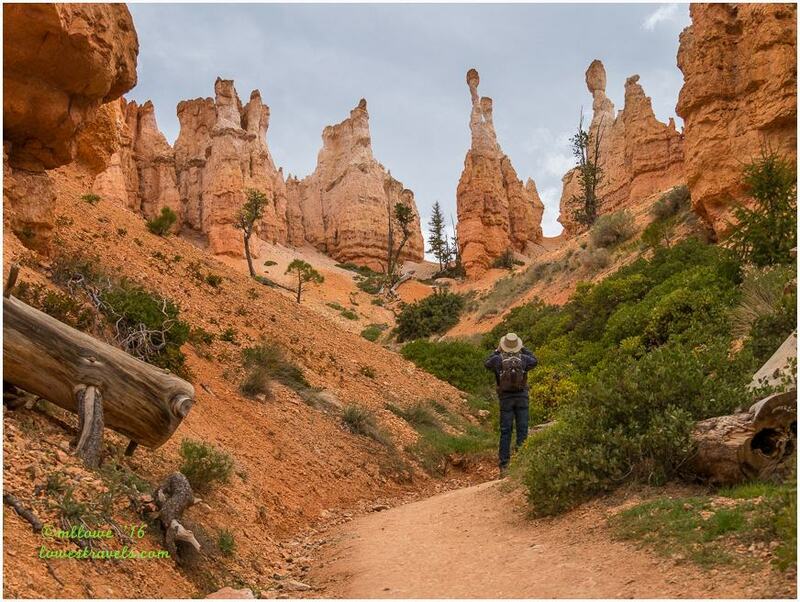 Great photos of an amazing place, can’t wait to get back since we still have a few trails to hike there. Lost 2 pounds the week we did all the hiking in that area. Hope you’re knee is feeling better. Your pictures are just stunning! The place is breath taking at every step but I’ve never seen pictures as magnificent as these. You really do it justice. Thank you so much. You’ve just lit a fire under my desire to go back there and stay longer. Love your hoo doo naming. Especially that first one. LOL!! 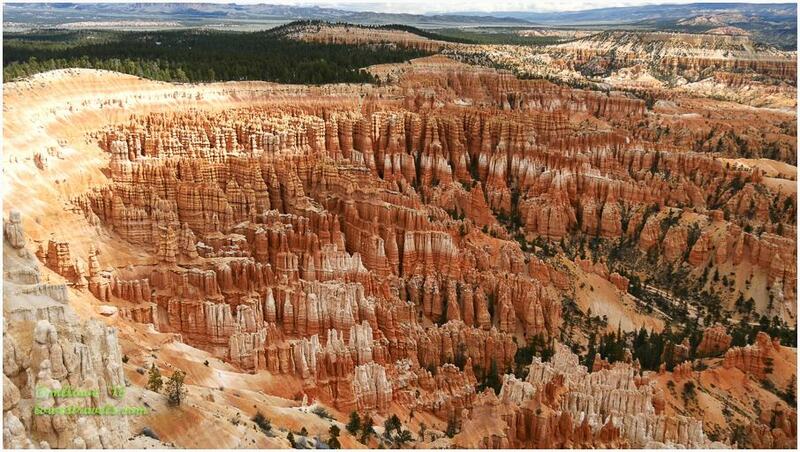 You’re right, it’s difficult to capture the magnificence of Bryce—but you guys did a great job! How cool that you hiked all of the trails. 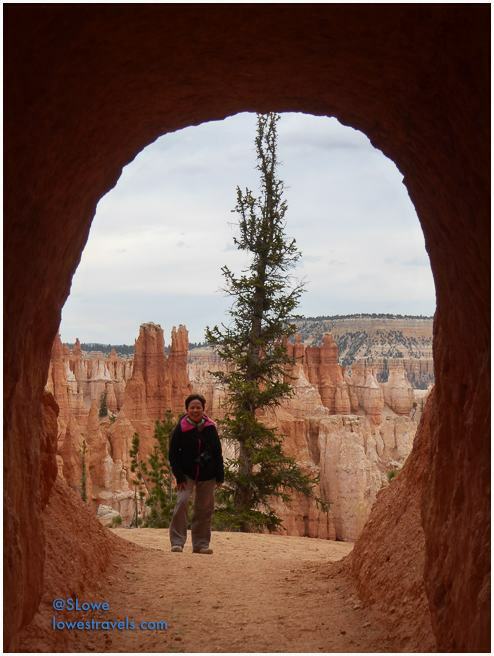 Queen’s Garden/Peekaboo/Navajo Loop is our favorite—but we haven’t yet hiked the Fairyland Trail. 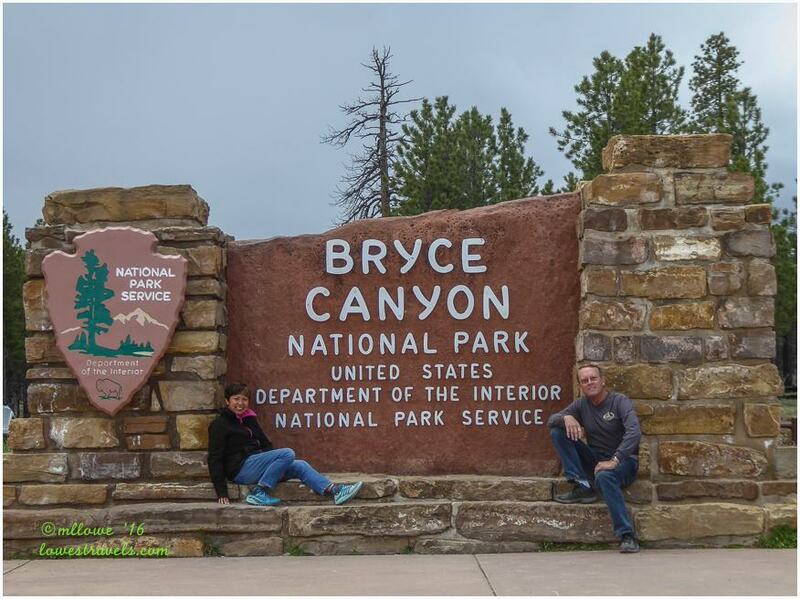 So sorry we missed seeing you in Bryce, but we didn’t want to be caught in the snow. 😦 Looks like a fun meet-up with Mike and Kathie—was Opie taking the photo? There are not enough words to describe the beauty of that area. This is only one of God’s masterpieces. Can you image what Heaven must look like. WOW! All the photos are outstanding. I especially like the boots photo. Brrrrr….to the scraping of the ice. You really captured the essence of Bryce! 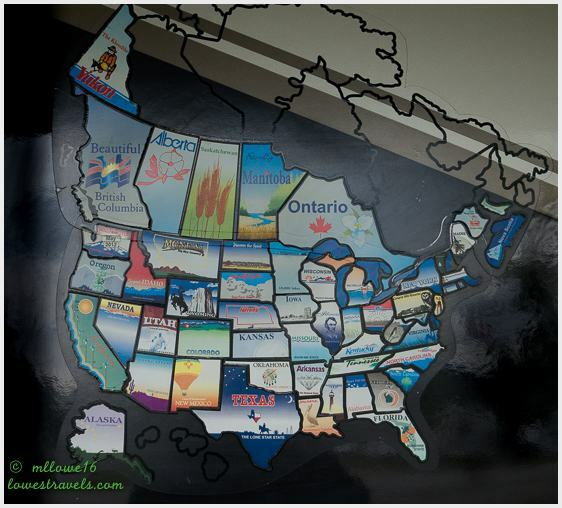 We met a couple from Utah who said we HAVE to visit it. So it looks like a month or two isn’t even enough? Can’t wait to see it in person.